So you’ve just had one of our bespoke kitchens designed and installed in your home. And to really enjoy it, you want to start cooking up some delicious meals. A problem that can sometimes occur when following recipes online is that the measurement might be in imperial (we have a collection of recipes of the month here on our blog if you want some inspiration). With a bit of Googling you can always find out the conversion to metric. 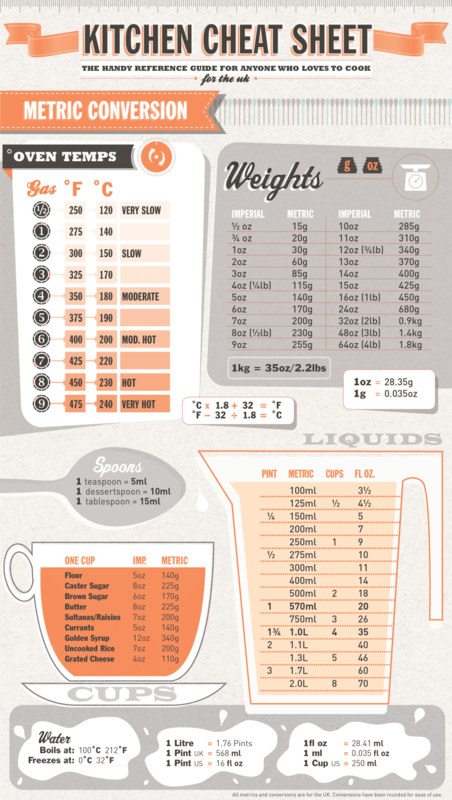 But we decided to make it that little bit easier by sharing this handy kitchen cheat sheet for imperial to metric conversion to help you in the kitchen should you be looking for a reference guide. This might be a good one to bookmark!